Tango is one of the most gorgeous, elegant and sensual dance of modern times. Known for its sensuality, it can express a wide range of emotions, from joy to sadness, from tenderness to passion. Are you a Tango lover or just wish to experience the magic and passion of this beautiful dance? The first ever "Baku Tango Festival" will take on October 4-7, Report.az reported. An international event of Argentine Tango with free entrance tango lessons, dance performances and live music awaits you. The festival is organized by the Argentine Embassy in Azerbaijan with the support of the local academies of dance "I.N. Tango", "Tango ON" and "R&N-Project Dance School" and the sponsorship of Passage 1901. All activities are free of charge. Azerbaijani, Georgian and Argentinean instructors will conduct open tango lessons and Argentine folklore. Those who wish can also receive private lessons. On October 7, there will be an Opening Milonga and a Chacarera lesson. From 20 hs until midnight dance lovers will enjoy dancing with live Tango music, performed by Aleksey Miltykh (cello), Jeyla Seyidova (violin) and Saida Tagi-zadeh (piano). During the breaks, the guest teachers and the local academies will give short dancing performs. 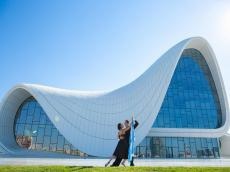 Notably, Azerbaijani tango teachers Ilham Osmanov and Alfiya Sultanova recently returned from Georgia, where they were invited to conduct lessons of Argentine tango within the framework of Georgia - Azerbaijan Tango Friendship Weekend. They came up with an indicative dance performance and received very high reviews about their dance technique and teaching methods. Together with their teachers Osmanov and Sultanova, students of dance studio " I N - Tango Baku also exchanged experience with the Georgian dancers.